For the past five years members of the OM team at Lake Tanganyika have visited the holding cells at the police station in Mupulungu, Zambia. Up to six days a week the team provides for the physical and spiritual needs of those awaiting trial and have seen God touch and transform the people’s hearts. Three cement cells hold men, and every once in a while women, for days or months at a time as they await sentencing. The small cells often have 20 or more men crowded into them so there is no space to properly lie down. They are not provided with food or even toilet facilities other than a plastic bucket. It is up to family members to provide for their incarcerated relatives daily needs, however, Mpulungu being a port town, many of those in the cells are not from the area. 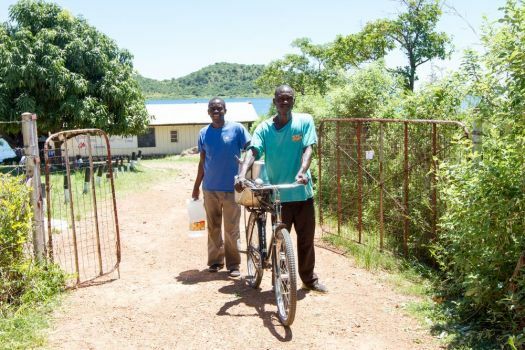 Around noon the OM Lake Tanganyika team brings food to the police station in large pots balanced on the back of a bicycle. For some, this is the only meal they receive. Besides the physical food, the team also provides spiritual food; the Word of God. After sharing and praying for them, the team encourages everyone to listen to scripture on an AudioBible given to each cell. “We have seen great impact through the AudioBibles,” said Shebele Kaunda, the prison ministry coordinator. With literacy levels low, the team has found doing bible studies using an AudioBible is more effective. With AudioBibles, even the illiterate are able to listen to the Word and everyone can share it at the same time. Those who have listened have grown interested in the Bible. One of the men asked Kaunda about Zacchaeus from the Bible. He was surprised that Jesus had wanted to visit Zacchaeus's house. Through that, Kaunda was able to share how Jesus came to earth for the sinners and is calling them as well. The man was amazed that God would still love him even if he was in prison. Joseph* used to be a fisherman and liked to drink and smoke. He didn’t know God. One day he was out fishing with a friend and they were both drunk. At one point out on the water he looked around the boat and realised his friend was no longer there. Afraid of being charged with murder, Joesph fled to Tanzania where he was later found and arrested. Brought back to Mpulungu, Joseph spent eight months in a holding cell. He got to know the OM team through their visits and shared his story with them. One team member recalls how Joseph had no interest in God but enjoyed talking with the team. Joseph was sentenced to seven years in prison in another town. Please pray that God will continue to provide for those awaiting sentencing. Pray that the Word of God continues entering their hearts and that they will see .